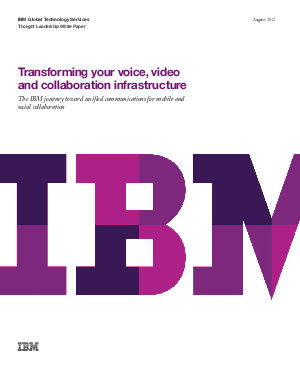 The IBM journey toward unified communications for mobile and social collaboration. Many of today's innovations are driven by the consumer marketplace, and the workplace is no exception. As consumers, we are very familiar with new ways for people to find each other, keepin touch, share ideas and be mobile, getting information from many place. As employees, we would like to apply these consumer capabilities to our work - seamlessly and on a global basis - to make us more productive and effective with business colleagues, clients and business partners. This white paper discusses IBMs infrastructure transformation over the first 12 years, summary value proposition, and volution in supporting mobile devices and BYOD.